Iowa Gov. 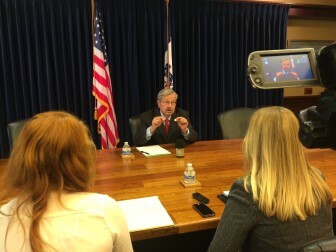 Terry Branstad in a July 7, 2015, interview with IowaWatch reporters Clare McCarthy and Makayla Tendall. 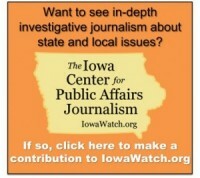 Do you like what you see from IowaWatch.org? If so, the Iowa Center for Public Affairs Journalism seeks your financial assistance to maintain the high level of investigative and community affairs journalism it does while training college students to do this work at a high level. Your support maintains this effort to inform the public and to train critically thinking young journalists who can sift through the superficial and be our next generation’s watchdogs. The Center has received major grants this past year from the Ethics and Excellence in Journalism Foundation, John S. and James L. Knight Foundation, Institute for Nonprofit News, The Gazette, KCRG-TV9 and Iowa State Bar Association. Other donations have come from the Community Foundation of Johnson County and individuals. However, we are striving to get local support from enterprises and people in Iowa or with an interest in the state as we try to match this funding. That local support is key to non-profit, non-partisan news organizations such as ours. I, as co-founder of IowaWatch.org, would like to congratulate you, the members of the IowaWatch family. 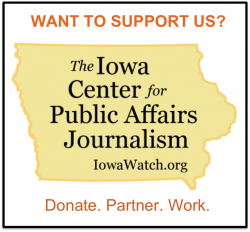 Thanks to your past support, IowaWatch’s journalistic success had earned for us a chance to receive up to $28,000 in matching funds from a $3 million national News Match 2017 fund drive.